Delving into archaic myths, Josep María Camí’s sculptural discourse is permeated by certain aspects of archetypical primitivism, further underlined by the presence of archaeological and ancestral signs, vestiges of the animal world, natural remnants, skeletons and fossils. Cami’s almost magical fascination with the past brings us closer to a poetic iconography poignant with nostalgia. Camí’s artistic endeavour seeks to combine nature’s formal repertoire with current sculptural canons, by balancing out the tension between biological and organic elements and matter’s technical requirements and endurance. This tension becomes even deeper as he problematises the relationship between the naturalistic references of the figurative world and the abstract world of pure geometry. Any work of Camí’s, this one included, allows for an organic reading of fierce, unruly rhythms, as well as shows vestiges or fragments of texturally course, rough objects. 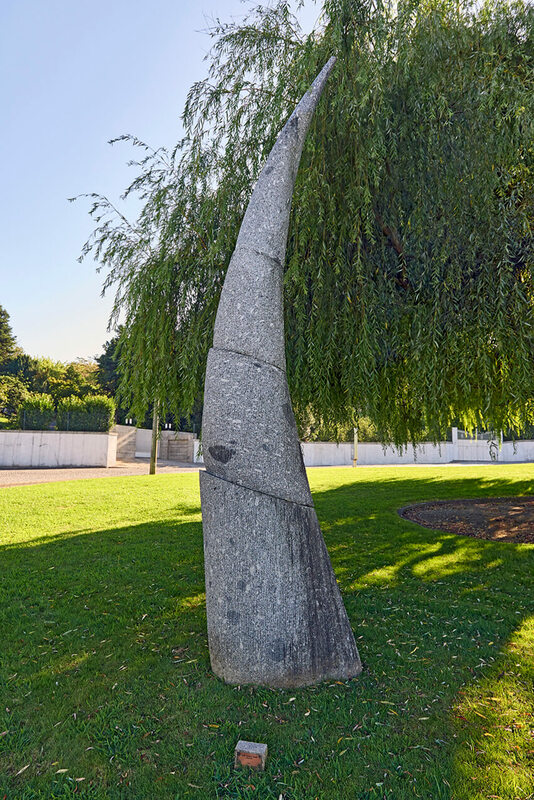 Feto [Fern] is another example of this Catalonian sculptor’s choice of organic shapes. A long, slightly curved cone made up of four sections reminds us of conches and animal and hunting horns, ultimately alluding to archaic sculptural shapes, found in the interspace between radical abstraction and intense, organic representation.